If you want to find how much the value of something has gone up or down over time, you often want to calculate the percentage increase or decrease in its value. For instance, stock market reports often say a particular stock went up or down, say, 5 percent in the course of the day. For more specific calculations, you might want to estimate the increase or decrease over time with more complex formulas. If you simply want to see the percent change in a value over time, there's a common and fairly simple formula you can use. Take the original value and the new value. Call them v1 and v2 for simplicity's sake. Then, subtract v1 from v2, divide the result by v1 and multiply by 100 to express the value as a percentage. In mathematical terms, we can write 100 * (v2 - v1) / v1. If the value is positive, it's a percent increase and if it's negative, it's a percent decrease. Naturally, if the two values are equal, the percent change is zero. What Are the Advantages of a Simple Moving Average Over an Exponential Moving Average? What Is Total Cumulative Shareholder Return? What Is the Difference Between a Constant Growth & a Non-Constant Growth Dividend Model? 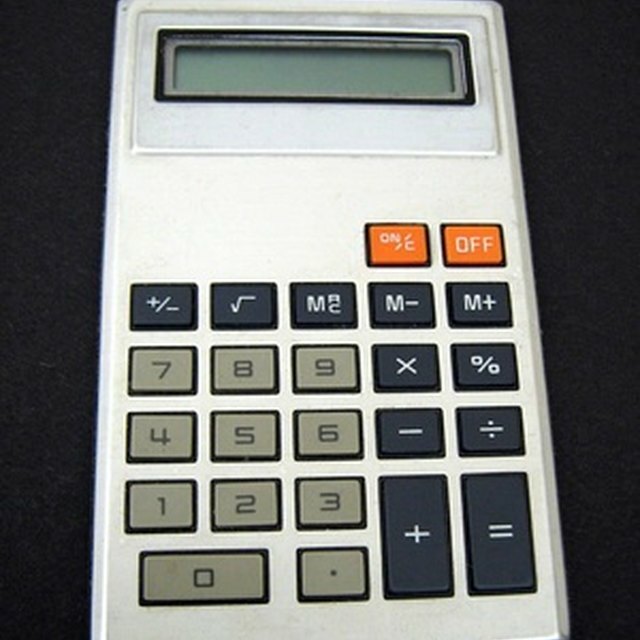 You can either do the computation yourself with a pocket calculator, a calculator app or pen and paper, or you can use a specialized online calculator designed for calculating percent changes. For example, imagine that a stock is trading at $12 at the close of the market on a particular day and was trading at $10 when the market opened. We want to calculate the percentage increase in the stock's value. So, we use 100 * (12 - 10) / 10 = 100 * 2 / 10 = 200 / 10 = 20 percent. The stock has gone up 20 percent in value during the day's trading session. In some cases, we may want a growth rate formula that determines how much a value changed, on average, over intermediate time intervals. For example, if that stock went from $10 to $20 in value over five years, we might want to find how much it increased on average each year. One way to do this is simply to divide the total increase – in this case, 100 percent – by the total number of time intervals, so we'd get 100 / 5 = 20 percent per year. That assumes that the growth rate was the same over each year, which may not be true in other cases. In other cases, we might use a more specialized formula to capture other mathematical assumptions, like an exponential or logarithmic growth rate. Generally different industries and use cases will have their own specific formulas for different scenarios that you can use directly with a pocket calculator or spreadsheet or through specialized digital tools. When it comes to interest rates you can earn on a bank account, the rate at which your money will increase is usually measured using something called annual percentage yield, or APY. This includes the effect of compounding interest, meaning paying interest on interest already added to the account's effective balance, over time. The rate is expressed as a percentage, as the name suggests. When it comes to loans that you take out, a similarly named figure called the annual percentage rate, or APR, is typically used to communicate the amount you'll pay per year. The APR doesn't include the effects of compounding interest, unlike an APY. It does include other costs, such as closing costs on a mortgage or fees charged for carrying a balance on a loan. Credit card companies and other organizations issuing loans are usually required to include the APR as well as a monthly rate. Growth is negative, if production decreases from one year to the next. Oregon State University: What’s the Difference between a Growth Rate and Percent Change?